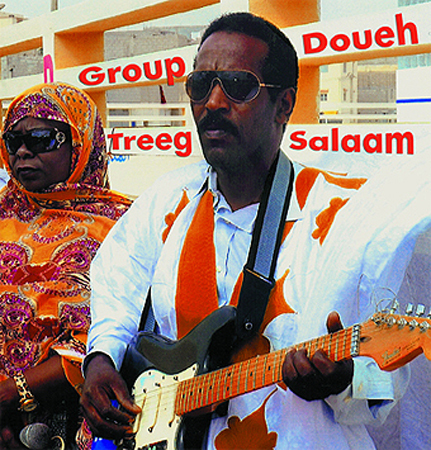 Group Doueh’s follow up to their now legendary debut is here. While most would think it damn near impossible to top the former release, in terms of sheer “shock and awe”, Treeg Salaam (Streets of Peace), blows hot and dusty from the infernal sand swept dunes of the Western Sahara. Compiled from Group Doueh’s personal archives, these five tracks are as brain shifting in their ecstatic brilliance as any music ever heard. From the Wah-stroked lead off track to the blazing dexterity of Ragsa Jaguar, the whole of the first side is an entrance to the lip-puckering tea den of Saharan trance heaven. Salmou Baamar's (Doueh) guitar/tinidit runs explode in cosmic shrapnel, raining down on the temporal nodes of the listener’s brain. On the final track we have a 20 minute, smoky, slow burning, psychedelic excursion into the great unknown. A meditation on the arid and inhospitable landscape that inspires this music and its people. LP is a one-time pressing of 1,500 copies. Pressed on 180 gram vinyl and comes in a gatefold full color jacket with great photos of the musicians.